For the current economy of France, see Economy of France. This is a history of the economy of France. For more information on historical, cultural, demographic and sociological developments in France, see the chronological era articles in the template to the right. For more information on specific political and governmental regimes in France, see the dynasty and regime articles. The collapse of the Roman Empire unlinked the French economy from Europe. Town life and trade declined and society became based on the self-sufficient manor. What limited international trade existed in the Merovingian age — primarily in luxury goods such as silk, papyrus, and silver — was carried out by foreign merchants such as the Radanites. Agricultural output began to increase in the Carolingian age as a result of the arrival of new crops, improvements in agricultural production, and good weather conditions. However, this did not lead to the revival of urban life; in fact, urban activity further declined in the Carolingian era as a result of civil war, Arab raids, and Viking invasions. The Pirenne hypotheses posits that at this disruption brought an end to long distance trade, without which civilisation retreated to purely agricultural settlements, and isolated military, church and royal centres. When trade revived these centres became the nucleus of new towns and cities around which suburbs of merchants and artisans grew. The High Middle Ages saw a continuation of the agricultural boom of the Carolingian age. In addition, urban life grew during this period; towns such as Paris expanded dramatically. The 13 decades from 1335 to 1450 spawned a series of economic catastrophes, with bad harvests, famines, plagues and wars that overwhelmed four generations of Frenchmen. The population had expanded, making the food supply more precarious. The bubonic plague ("Black Death") hit Western Europe in 1347, killing a third of the population, and it was echoed by several smaller plagues at 15 year intervals. The French and English armies during the Hundred Years War marched back and forth across the land; they did not massacre civilians, but they drained the food supply, disrupted agriculture and trade, and left disease and famine in their wake. Royal authority weakened, as local nobles became strongmen fighting their neighbors for control of the local region. France's population plunged from 17 million, down to 12 million in 130 years. Finally, starting in the 1450s, a long cycle of recuperation began. (Figures cited in the following section are given in livre tournois, the standard "money of account" used in the period. Comparisons with modern figures are extremely difficult; food items were comparatively cheap, but luxury goods and fabrics were very expensive. In the 15th century, an artisan could earn perhaps 30 livres a year; a great noble could have land revenues from 6000 to 30,000 livres or more. A late seventeenth-century unskilled worker in Paris earned around 250 livres a year, while a revenue of 4000 livres a year maintained a relatively successful writer in modest comfort. At the end of the 18th century, a well-off family could earn 100,000 livres by year, although the most prestigious families could gain twice or three times that much, while, for provincial nobility, yearly earnings of 10,000 livres permitted a minimum of provincial luxury). The economy of Renaissance France was, for the first half-century, marked by a dynamic demographic growth and by developments in agriculture and industry. Until 1795, France was the most populated country in Europe and the third most populous country in the world, behind only China and India. With an estimated population of 17 million in 1400, 20 million in the 17th century, and 28 million in 1789, its population exceeded even Russia and was twice the size of Britain and Holland. In France, the Renaissance was marked by a massive increase in urban populations, although on the whole, France remained a profoundly rural country, with less than 10% of the population located in urban areas. Paris was one of the most populated cities in Europe, with an estimated population of 650,000 by the end of the 18th century. Agricultural production of a variety of food items expanded: olive oil, wine, cider, woad (Fr. "pastel", a source of blue dye), and saffron. The South grew artichokes, melons, romaine lettuce, eggplant, salsifys, celery, fennel, parsley, and alfalfa. After 1500 New World crops appeared such as beans, corn (maize), squash, tomatoes, potatoes, and bell peppers. Production techniques remained attached to medieval traditions and produced low yields. With the rapidly expanding population, additional land suitable for farming became scarce. The situation was made worse by repeated disastrous harvests in the 1550s. Industrial developments greatly affected printing (introduced in 1470 in Paris, 1473 in Lyon) and metallurgy. The introduction of the high-temperature forge in northeast France and an increase in mineral mining were important developments, although it was still necessary for France to import many metals, including (copper, bronze, tin, and lead). Mines and glasswork benefited greatly from royal tax exemptions for a period of about twenty years. Silk production (introduced in Tours in 1470 and in Lyon in 1536) enabled the French to join a thriving market, but French products remained of lesser quality than Italian silks. Wool production was widespread, as was the production of linen and of hemp (both major export products). After Paris, Rouen was the second largest city in France (70,000 inhabitants in 1550), in large part because of its port. Marseille (French since 1481) was France's second major port: it benefited greatly from France's trading agreements signed in 1536 with Suleiman the Magnificent. To increase maritime activity, Francis I founded the port city of Le Havre in 1517. Other significant ports included Toulon, Saint Malo and La Rochelle. Lyon was the center of France's banking and international trade markets. Market fairs occurred four times a year and facilitated the exportation of French goods, such as cloth and fabrics, and importation of Italian, German, Dutch, English goods. It also allowed the importation of exotic goods such as silks, alum, glass, wools, spices, dyes. Lyon also contained houses of most of Europe's banking families, including Fugger and Medici. Regional markets and trade routes linked Lyon, Paris and Rouen to the rest of the country. Under Francis I and Henry II, the relationships between French imports and the exports to England and to Spain were in France's favor. Trade was roughly balanced with the Netherlands, but France continually ran a large trade deficit with Italy due to the latter's silks and exotic goods. In subsequent decades, English, Dutch and Flemish maritime activity would create competition with French trade, which would eventually displace the major markets to the northwest, leading to the decline of Lyon. Although France, being initially more interested in the Italian wars, arrived late to the exploration and colonization of the Americas, private initiative and piracy brought Bretons, Normans and Basques early to American waters. Starting in 1524, Francis I began to sponsor exploration of the New World. Significant explorers sailing under the French flag included Giovanni da Verrazzano and Jacques Cartier. Later, Henry II sponsored the explorations of Nicolas Durand de Villegaignon who established a largely Calvinist colony in Rio de Janeiro, 1555-1560. Later, René Goulaine de Laudonnière and Jean Ribault established a Protestant colony in Florida (1562–1565). (see French colonisation of the Americas). By the middle of the 16th century, France's demographic growth, its increased demand for consumer goods, and its rapid influx of gold and silver from Africa and the Americas led to inflation (grain became five times as expensive from 1520 to 1600), and wage stagnation. Although many land-owning peasants and enterprising merchants had been able to grow rich during the boom, the standard of living fell greatly for rural peasants, who were forced to deal with bad harvests at the same time. This led to reduced purchasing power and a decline in manufacturing. The monetary crisis led France to abandon (in 1577) the livre as its money of account, in favor of the écu in circulation, and banning most foreign currencies. Meanwhile, France's military ventures in Italy and (later) disastrous civil wars demanded huge sums of cash, which were raised with through the taille and other taxes. The taille, which was levied mainly on the peasantry, increased from 2.5 million livres in 1515 to 6 million after 1551, and by 1589 the taille had reached a record 21 million livres. Financial crises hit the royal household repeatedly, and so in 1523, Francis I established a government bond system in Paris, the "rentes sur l'Hôtel de Ville". The French Wars of Religion were concurrent with crop failures and epidemics. The belligerents also practiced massive "torched earth" strategies to rob their enemies of foodstuffs. Brigands and leagues of self-defense flourished; transport of goods ceased; villagers fled to the woods and abandoned their lands; towns were set on fire. The south was particularly affected: Auvergne, Lyon, Burgundy, Languedoc—agricultural production in those areas fell roughly 40%. The great banking houses left Lyon: from 75 Italian houses in 1568, there remained only 21 in 1597. In the 17th century rich peasants who had ties to the market economy provided much of the capital investment necessary or agricultural growth, and frequently moved from village to village (or town). Geographic mobility, directly tied to the market and the need for investment capital, was the main path to social mobility. The "stable" core of French society, town guildspeople and village laboureurs, included cases of staggering social and geographic continuity, but even this core required regular renewal. Accepting the existence of these two societies, the constant tension between them, and extensive geographic and social mobility tied to a market economy holds the key to a clearer understanding of the evolution of the social structure, economy, and even political system of early modern France. Collins (1991) argues that the Annales School paradigm underestimated the role of the market economy; failed to explain the nature of capital investment in the rural economy; and grossly exaggerated social stability. After 1597, France economic situation improved and agricultural production was aided by milder weather. Henry IV, with his minister Maximilien de Béthune, duc de Sully, adopted monetary reforms. These included better coinage, a return to the livre tournois as an account money, reduction of the debt, which was 200 million livres in 1596, and a reduction of the tax burden on peasants. Henry IV attacked abuses, embarked on a comprehensive administrative reform, increased charges for official offices, the "paulette", repurchased alienated royal lands, improved roads and the funded the construction of canals, and planted the seed of a state-supervised mercantile philosophy. Under Henry IV, agricultural reforms, largely started by Olivier de Serres were instituted. These agricultural and economic reforms, and mercantilism, would also be the policies of Louis XIII's minister Cardinal Richelieu. In an effort to counteract foreign imports and exploration, Richelieu sought alliances with Morocco and Persia, and encouraged exploration of New France, the Antilles, Sénégal, Gambia and Madagascar, though only the first two were immediate successes. These reforms would establish the groundwork for the Louis XIV's policies. Louis XIV's glory was irrevocably linked to two great projects, military conquest and the building of Versailles—both of which required enormous sums of money. To finance these projects, Louis created several additional tax systems, including the "capitation" (begun in 1695) which taxed every person including nobles and the clergy, though exemption could be bought for a large one-time sum, and the "dixième" (1710–1717, restarted in 1733), which was a true tax on income and on property value and was meant to support the military. Louis XIV's minister of finances, Jean-Baptiste Colbert, started a mercantile system which used protectionism and state-sponsored manufacturing to promote the production of luxury goods over the rest of the economy. The state established new industries (the royal tapestry works at Beauvais, French quarries for marble), took over established industries (the Gobelins tapestry works), protected inventors, invited workmen from foreign countries (Venetian glass and Flemish cloth manufacturing), and prohibited French workmen from emigrating. To maintain the character of French goods in foreign markets, Colbert had the quality and measure of each article fixed by law, and severely punished breaches of the regulations. This massive investment in (and preoccupation with) luxury goods and court life (fashion, decoration, cuisine, urban improvements, etc. ), and the mediatization (through such gazettes as the Mercure galant) of these products, elevated France to a role of arbiter of European taste. Unable to abolish the duties on the passage of goods from province to province, Colbert did what he could to induce the provinces to equalize them. His régime improved roads and canals. To encourage companies like the important French East India Company (founded in 1664), Colbert granted special privileges to trade with the Levant, Senegal, Guinea and other places, for the importing of coffee, cotton, dyewoods, fur, pepper, and sugar, but none of these ventures proved successful. Colbert achieved a lasting legacy in his establishment of the French royal navy; he reconstructed the works and arsenal of Toulon, founded the port and arsenal of Rochefort, and the naval schools of Rochefort, Dieppe and Saint-Malo. He fortified, with some assistance from Vauban, many ports including those of Calais, Dunkirk, Brest and Le Havre. Colbert's economic policies were a key element in Louis XIV's creation of a centralized and fortified state and in the promotion of government glory, including the construction they had many economic failures: they were overly restrictive on workers, they discouraged inventiveness, and had to be supported by unreasonably high tariffs. The Revocation of the Edict of Nantes in 1685 created additional economic problems: of the more than 200,000 Huguenot refugees who fled France for Prussia, Switzerland, England, Ireland, United Provinces, Denmark, South Africa and eventually America, many were highly educated skilled artisans and business-owners who took their skills, businesses, and occasionally even their Catholic workers, with them. Both the expansion of French as a European lingua franca in the 18th century, and the modernization of the Prussian army have been credited to the Huguenots. The wars and the weather at the end of the century brought the economy to the brink: by 1715, the trade deficit had reached 1.1 trillion livres. To increase tax revenues, the taille was augmented, as too were the prices of official posts in the administration and judicial system. With the borders guarded due to war, international trade was severely hindered. The economic plight of the vast majority of the French population — predominantly simple farmers — was extremely precarious, and the Little Ice Age resulted in further crop failures. Unwilling to sell or transport their much-needed grain to the army, many peasants rebelled or attacked grain convoys, but they were repressed by the state. Meanwhile, wealthy families with stocks of grains survived relatively unscathed; in 1689 and again in 1709, in a gesture of solidarity with his suffering people, Louis XIV had his royal dinnerware and other objects of gold and silver melted down. France experienced a slow economic and demographic recovery in the first decades following the death of Louis XIV, although monetary confidence was briefly eroded by the disastrous paper money "System" introduced by John Law from 1716 to 1720. In 1726, under Louis XV's minister Cardinal Fleury, a system of monetary stability was put in place, leading to a strict conversion rate between gold and silver, and set values for the coins in circulation in France. Starting in the late 1730s and early 1740s, and continuing for the next 30 years, France's population and economy underwent an important expansion. Rising prices, particularly for agricultural products, were extremely profitable for large landholders. Artisans and tenant farmers also saw wage increases but on the whole they benefited less from the growing economy. Pivotal developments in agriculture such as modern techniques of crop rotation and the use of fertilizers, which were modeled on successes in Britain and Italy, began to be introduced in parts of France. It would, however, take generations for these reforms to spread throughout all of France. Farming of recent New World crops, including maize and potatoes, continued to expand and provided an important supplement to the diet. The most dynamic industries of the period were mines, metallurgy and textiles (in particular printed fabrics, such as those made by Christophe-Philippe Oberkampf). The advancements in these areas were often due to foreigners. For example, it was John Kay's invention of the flying shuttle that revolutionized the textile industry, and it was James Watt's steam engine that changed industry as the French had known it. Capital remained difficult to raise for commercial ventures, however, and the state remained highly mercantilistic, protectionist, and interventionist in the domestic economy, often setting requirements for production quality and industrial standards, and limiting industries to certain cities. The international commercial centers of the country were based in Lyon, Marseille, Nantes, and Bordeaux. Nantes and Bordeaux saw phenomenal growth due to an increase of trade with Spain and Portugal. Cadiz was the commercial hub for export of French printed fabrics to India, the Americas and the Antilles (coffee, sugar, tobacco, American cotton), and Africa (the slave trade), centered in Nantes. In 1749, a new tax, modelled on the "dixième" and called the "vingtième" (or "one-twentieth"), was enacted to reduce the royal deficit. This tax continued throughout the ancien régime. It was based solely on revenues, requiring 5% of net earnings from land, property, commerce, industry and from official offices, and was meant to touch all citizens regardless of status. However, the clergy, the regions with "pays d'état" and the parlements protested; the clergy won exemption, the "pays d'état" won reduced rates, and the parlements halted new income statements, effectively making the "vingtième" a far less efficient tax than it was designed to be. The financial needs of the Seven Years' War led to a second (1756–1780), and then a third (1760–1763), "vingtième" being created. In 1754, the "vingtième" produced 11.7 million livres. The later years of Louis XV's reign saw some economic setbacks. While the Seven Years' War, 1756–1763, led to an increase in the royal debt and the loss of nearly all of France's North American possessions, it was not until 1775 that the French economy began truly to enter a state of crisis. An extended reduction in agricultural prices over the previous twelve years, with dramatic crashes in 1777 and 1786, and further complicated by climatic events such as the disastrous winters of 1785-1789 contributed to the problem. With the government deeply in debt, Louis XVI was forced to permit the radical reforms of Turgot and Malesherbes. However, the nobles' disaffection led to Turgot's dismissal and Malesherbes' resignation 1776. Jacques Necker replaced them. Louis supported the American Revolution in 1778, but the Treaty of Paris (1783) yielded the French little, excepting an addition to the country's enormous debt. The government was forced to increase taxes, including the "vingtième." Necker had resigned in 1781, to be replaced temporarily by Calonne and Brienne, but he was restored to power in 1788. In these last decades of the century, French industries continued to develop. Mechanization was introduced, factories were created, and monopolies became more common. However, this growth was complicated by competition from England in the textiles and cotton industries. On the other hand, French commercial ventures continued to expand, both domestically and internationally. The American War of Independence had led to a reduction of trade (cotton and slaves), but by the 1780s American trade was stronger than before. Similarly, the Antilles represented the major source for European sugar and coffee, and it was a huge importer of slaves through Nantes. Paris became France's center of international banking and stock trades, in these last decades (like Amsterdam and London), and the Caisse d'Escompte was founded in 1776. 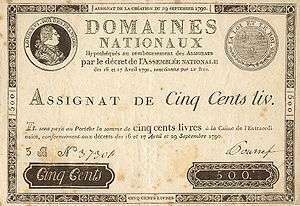 Paper money was re-introduced, denominated in livres; these were issued until 1793. The agricultural and climatic problems of the 1770s and 1780s led to an important increase in poverty: in some cities in the north, historians have estimated the poor as reaching upwards of 20% of the urban population. Displacement and criminality, mainly theft, also increased, and the growth of groups of mendicants and bandits became a problem. Although nobles, bourgeois, and wealthy landholders saw their revenues affected by the depression, the hardest-hit in this period were the working class and the peasants. While their tax burden to the state had generally decreased in this period, feudal and seigneurial dues had increased. French economic history since its late-18th century Revolution was tied to three major events and trends: the Napoleonic Era, the competition with Britain and its other neighbors in regards to 'industrialization', and the 'total wars' of the late-19th and early 20th centuries. The post-war period, since 1950, saw significant new departures in both economic development and the policies designed to affect it. "The French Revolution abolished many of the constraints on the economy that had emerged during the old regime. It abolished the guild system as a worthless remnant of feudalism." It also abolished the highly inefficient system of tax farming, whereby private individuals would collect taxes for a hefty fee. The government seized the foundations that had been set up (starting in the 13th century) to provide an annual stream of revenue for hospitals, poor relief, and education. The state sold the lands but typically local authorities did not replace the funding and so most of the nation's charitable and school systems were massively disrupted. The economy did poorly in 1790-96 as industrial and agricultural output dropped, foreign trade plunged, and prices soared. The government decided not to repudiate the old debts. Instead it issued more and more paper money (called "assignat") that supposedly were grounded seized lands. The result was escalating inflation. The government imposed price controls and persecuted speculators and traders in the black market. People increasingly refused to pay taxes as the annual government deficit increased from 10% of gross national product in 1789 to 64% in 1793. By 1795, after the bad harvest of 1794 and the removal of price controls, inflation had reached a level of 3500%. The assignats were withdrawn in 1796 but the replacements also fueled inflation. The inflation was finally ended by Napoleon in 1803 with the franc as the new currency. Agriculture was transformed by the Revolution. It abolished tithes owed to local churches as well as feudal dues owed to local landlords. The result hurt the tenants, who paid both higher rents and higher taxes. It nationalized all church lands, as well as lands belonging to royalist enemies who went into exile. It planned to use these seized lands to finance the government by issuing assignats. With the breakup of large estates controlled by the Church and the nobility and worked by hired hands, rural France became permanently a land of small independent farms. The rural proletariat and nobility both gave way to the commercial farmer. Cobban says the revolution "bequeathed to the nation "a ruling class of landowners." In the cities entrepreneurship on a small scale flourished, as restrictive monopolies, privileges, barriers, rules, taxes and guilds gave way. However the British blockade severely damaged overseas trade. Overall the Revolution did not greatly change the French business system, and probably helped freeze in place the horizons of the small business owner. The typical businessman owned a small store, mill or shop, with family help and a few paid employees; large-scale industry was less common than in other industrializing nations. Napoleon after 1799 paid for his expensive wars by multiple means, starting with the modernization of the rickety financial system. He conscripted soldiers at low wages, raised taxes, placed large-scale loans, sold lands formerly owned by the Catholic Church, sold Louisiana to the United States, plundered conquered areas and seized food supplies, and levied requisitions on countries he controlled, such as Italy. The constant "war-footing" of the Napoleonic Era, 1795–1815, stimulated production at the cost of investment and growth. Production of armaments and other military supplies, fortifications, and the general channeling of the society toward the establishment and maintenance of massed armies, temporarily increased economic activity after several years of revolution. The rampant inflation of the Revolutionary era was halted by not printing the new currency quite as fast. The maritime Continental Blockade, implemented by Napoleon's opponents and very effectively enforced by the Royal Navy, gradually cut into any economic arena in which the French economy was not self-sufficient. 1815 saw the final defeat of the French forces and the collapse of its war footing. Paris emerged as an international center of finance in the mid-19th century second only to London. It had a strong national bank and numerous aggressive private banks that financed projects all across Europe and the expanding French Empire. Napoleon III had the goal of overtaking London to make Paris the premier financial center of the world, but the war in 1870 reduced the range of Parisian financial influence. One key development was setting up one of the main branches of the Rothschild family. In 1812, James Mayer Rothschild arrived in Paris from Frankfurt, and set up the bank "De Rothschild Frères". This bank funded Napoleon's return from Elba and became one of the leading banks in European finance. The Rothschild banking family of France funded France's major wars and colonial expansion. The Banque de France, founded in 1796 helped resolve the financial crisis of 1848 and emerged as a powerful central bank. The Comptoir National d'Escompte de Paris (CNEP) was established during the financial crisis and the republican revolution of 1848. Its innovations included both private and public sources in funding large projects, and the creation of a network of local offices to reach a much larger pool of depositors. The Péreire brothers founded the Crédit Mobilier. It became a powerful and dynamic funding agency for major projects in France, Europe and the world at large. It specialized in mining developments; it funded other banks including the Imperial Ottoman Bank and the Austrian Mortgage Bank; it funded railway construction. It also funded insurance companies and building contractors. The bank had large investments in a transatlantic steamship line, urban gas lighting, a newspaper and the Paris Paris Métro public transit system. Other major banks included the Société Générale, and in the provinces the Crédit Lyonnais. The war with Prussia in 1870-71 was a major blow to the French banks. The 1870s and 1880s saw severe difficulties as they struggled to finance the reparations owed to Germany. The Paris Bourse or stock exchange emerged as a key market for investors to buy and sell securities. It was primarily a forward market, and it pioneered in creating a mutual guarantee fund so that failures of major brokers would not escalate into a devastating financial crisis. Speculators in the 1880s who disliked the control of the Bourse used a less regulated alternative the Coulisse. However it collapsed in the face of the simultaneous failure of a number of its brokers in 1895–1896. The Bourse secured legislation that guaranteed its monopoly, increased control of the curb market, and reduced the risk of another financial panic. Re-establishing the economy on a peacetime basis, after a quarter-century of nearly continuous turmoil and warfare, proved difficult. Some industry and industrial technique developed for the wars was carried over, converted to peacetime purposes. France in 1815 largely still was a land of peasantry, however. Urbanization of the largest cities was well under way, and Paris was a leading world capital already. Smaller French towns and the country's many small villages, however, were impoverished and industrially backward. The 19th century development of road and rail systems, and other social infrastructure, was greatly aided by the grandes écoles, inherited from the prior era: graduates of these high-standards schools became the engineers and policy-makers of French industrialization. Industrial development in France was rapid during the 19th century. Around the great cities, and in the north and in other areas which had natural resources readily available, large industries formed. Capital was available through banking services largely located, since the Revolution, in Paris. The large French population of the time supplied an available workforce. Education was made a high priority of successive French governments. Various educational reforms, implemented from the central government at Paris and applied nationally, were designed to raise the general level of the children of French rural and small-town families to a high national level. At the same time, education spread new and often radical ideas, fueling repeated resistance to and even revolt against the deplorable living conditions of many workers in the new industries and factory towns. By the middle of the 19th century, France had joined the industrial era. By the end of the 19th century, France, comparatively, had lost competitiveness with its war-footing neighbor Germany, and with its trade-based chief rival across the English Channel, Great Britain. In France, railways became a national medium for the modernization of backward regions, and a leading advocate of this approach was the poet-politician Alphonse de Lamartine. One writer hoped that railways might improve the lot of "populations two or three centuries behind their fellows" and eliminate 'the savage instincts born of isolation and misery." Consequently, France built a centralized system that radiated from Paris (plus lines that cut east to west in the south). This design was intended to achieve political and cultural goals rather than maximize efficiency. After some consolidation, six companies controlled monopolies of their regions, subject to close control by the government in terms of fares, finances, and even minute technical details. The central government department of Ponts et Chaussées (bridges and roads, or the Highways Department) brought in British engineers and workers, handled much of the construction work, provided engineering expertise and planning, land acquisition, and construction of permanent infrastructure such as the track bed, bridges and tunnels. It also subsidized militarily necessary lines along the German border, which was considered necessary for the national defense. Private operating companies provided management, hired labor, laid the tracks, and built and operated stations. They purchased and maintained the rolling stock—6,000 locomotives were in operation in 1880, which averaged 51,600 passengers a year or 21,200 tons of freight. Much of the equipment was imported from Britain and therefore did not stimulate machinery makers. Although starting the whole system at once was politically expedient, it delayed completion, and forced even more reliance on temporary exports brought in from Britain. Financing was also a problem. The solution was a narrow base of funding through the Rothschilds and the closed circles of the Bourse in Paris, so France did not develop the same kind of national stock exchange that flourished in London and New York. The system did help modernize the parts of rural France it reached, but it did not help create local industrial centers. Critics such as Émile Zola complained that it never overcame the corruption of the political system, but rather contributed to it. The railways helped the industrial revolution in France by facilitating a national market for raw materials, wines, cheeses, and imported manufactured products. Yet the goals set by the French for their railway system were moralistic, political, and military rather than economic. As a result, the freight trains were shorter and less heavily loaded than those in such rapidly industrializing nations such as Britain, Belgium or Germany. Other infrastructure needs in rural France, such as better roads and canals, were neglected because of the expense of the railways, so it seems likely that there were net negative effects in areas not served by the trains. In 1870 the relative decline in industrial strength, compared to Bismarck's Germany, proved decisive in the Franco-Prussian War. The total defeat of France, in this conflict, was less a demonstration of French weakness than it was of German militarism and industrial strength. This contrasted with France's occupation of Germany during the Napoleonic wars. A huge sum had to be paid to Germany to end the war which provided the latter with even more capital. By 1914, however, German armament and general industrialization had out-distanced not only France but all of its neighbors. Just before 1914, France was producing about one-sixth as much coal as Germany, and a quarter as much steel. France was a rural nation with the peasant farmer the typical citizen. In his seminal book Peasants Into Frenchmen (1976), historian Eugen Weber traced the modernization of French villages and argued that rural France went from backward and isolated to modern and possessing a sense of French nationhood during the late 19th and early 20th centuries. He emphasized the roles of railroads, republican schools, and universal military conscription. He based his findings on school records, migration patterns, military service documents and economic trends. Weber argued that until 1900 or so a sense of French nationhood was weak in the provinces. Weber then looked at how the policies of the Third Republic created a sense of French nationality in rural areas. The book was widely praised, but was criticized by some who argued that a sense of Frenchness existed in the provinces before 1870. Paris became world famous for making consumerism a social priority and economic force, especially through its upscale arcades filled with luxury shops and its grand department stores. These were "dream machines" that set the world standard for consumption of fine products by the upper classes as well as the rising middle class. Aristide Boucicaut founded Le Bon Marché in Paris in 1838, and by 1852 it offered a wide variety of goods in "departments" inside one building.". Goods were sold at fixed prices, with guarantees that allowed exchanges and refunds. The French gloried in the national prestige brought by the great Parisian stores. The great writer Émile Zola (1840-1902) set his novel Au Bonheur des Dames (1882–83) in the typical department store. Zola represented it as a symbol of the new technology that was both improving society and devouring it. The novel describes merchandising, management techniques, marketing, and consumerism. The Grands Magasins Dufayel was a huge department store with inexpensive prices built in 1890 in the northern part of Paris, where it reached a very large new customer base in the working class. In a neighborhood with few public spaces, it provided a consumer version of the public square. It educated workers to approach shopping as an exciting social activity not just a routine exercise in obtaining necessities, just as the bourgeoisie did at the famous department stores in the central city. Like the bourgeois stores, it helped transform consumption from a business transaction into a direct relationship between consumer and sought-after goods. Its advertisements promised the opportunity to participate in the newest, most fashionable consumerism at reasonable cost. The latest technology was featured, such as cinemas and exhibits of inventions like X-ray machines (that could be used to fit shoes) and the gramophone. Increasingly after 1870 the stores' work force became feminized, opening up prestigious job opportunities for young women. Despite the low pay and long hours they enjoyed the exciting complex interactions with the newest and most fashionable merchandise and upscale customers. The overall growth rate of the French economy shows a very strong performance in the 1920s and again in the 1960s, with poor performances in the 1910s, 1930s, and 1990s. The economy was seriously hurt by the German seizure of major industrial areas in the northeast. While the occupied area in 1913 contained only 14% of France's industrial workers, it produced 58% of the steel, and 40% of the coal. Considerable relief came with the influx of American food, money and raw materials in 1917. On the other hand, the economy was helped by American loans which were used to purchase foods and manufactured goods that allowed a decent standard of living. The arrival of over a million American soldiers in 1918 brought heavy spending for food and construction materials. Labor shortages were in part alleviated by the use of volunteer workers from the colonies. The worldwide decline after 1929 affected France a bit later than other countries, hitting around 1931. The depression was relatively mild: unemployment peaked under 5%, the fall in production was at most 20% below the 1929 output; there was no banking crisis. However, the depression had some effects on the local economy, and partly explains the February 6, 1934 riots and even more the formation of the Popular Front, led by SFIO socialist leader Léon Blum, which won the elections in 1936. Hardship and unemployment were high enough to lead to rioting and the rise of the socialist Popular Front, which won the 1936 elections with a coalition of Socialists and Radicals, and support from the Communists. Léon Blum became the first Socialist prime minister. stipulated that employers would recognise shop stewards. ensured that there would be no retaliation against strikers. The 1920 Sales Tax, opposed by the Left as a tax on consumers, was abolished and replaced by a production tax, which was considered to be a tax on the producer instead of the consumer. Blum persuaded the workers to accept pay raises and go back to work. Wages increased sharply, in two years the national average was up 48 percent. However inflation also rose 46%. The imposition of the 40-hour week proved highly inefficient, as industry had a difficult time adjusting to it. The economic confusion hindered the rearmament effort, and the rapid growth of German armaments alarmed Blum. He launched a major program to speed up arms production. The cost forced the abandonment of the social reform programs of the popular front had counted heavily on. Economic historians point to numerous bad financial and economic policies, such as delayed devaluation of the franc, which made French exports uncompetitive. Economists especially emphasize the bad effects of the 40-hour week, which made overtime illegal, forcing employers to stop work or to replace their best workers with inferior and less experienced workers when that 40-hour limit was reached. More generally the argument is made that France could not afford the labor reforms, in the face of poor economic conditions, the fears of the business community and the threat of Nazi Germany. The consensus of historians is to judge the Popular Front a failure in terms of economics, foreign policy, and long-term political stability. "Disappointment and failure," says Jackson, "was the legacy of the Popular Front." However, it did inspire later reformers who set up the modern French welfare state. Conditions in Vichy France under German occupation were very harsh, because the Germans stripped France of millions of workers (as prisoners of war and "voluntary" workers), and as well stripped much of the food supply, while demanding heavy cash payments. It was a period of severe economic hardship under a totalitarian government. Vichy rhetoric exalted the skilled laborer and small businessman. In practice, however, the needs of artisans for raw materials was neglected in favor of large businesses. The General Committee for the Organization of Commerce (CGOC) was a national program to modernize and professionalize small business. In 1940 the government took direct control of all production, which was synchronized with the demands of the Germans. It replaced free trade unions with compulsory state unions that dictated labor policy without regard to the voice or needs of the workers. The centralized, bureaucratic control of the French economy was not a success, as German demands grew heavier and more unrealistic, passive resistance and inefficiencies multiplied, and Allied bombers hit the rail yards; however, Vichy made the first comprehensive long-range plans for the French economy. The government had never before attempted a comprehensive overview. De Gaulle's Provisional Government in 1944-45, quietly used the Vichy plans as a base for its own reconstruction program. The Monnet Plan of 1946 was closely based on Vichy plans. Thus both teams of wartime and early postwar planners repudiated prewar laissez-faire practices and embraced the cause of drastic economic overhaul and a planned economy. Nazi Germany kept nearly 2.5 million French Army POWs as forced laborers throughout the war. They added compulsory (and volunteer) workers from occupied nations, especially in metal factories. The shortage of volunteers led the Vichy government to pass a law in September 1941 that effectively deported workers to Germany, where, they constituted 17% of the labor force by August 1943. The largest number worked in the giant Krupp steel works in Essen. Low pay, long hours, frequent bombings, and crowded air raid shelters added to the unpleasantness of poor housing, inadequate heating, limited food, and poor medical care, all compounded by harsh Nazi discipline. They finally returned home in the summer of 1945. The forced labour draft encouraged the French Resistance and undermined the Vichy government. Civilians suffered shortages of all varieties of consumer goods. The rationing system was stringent but badly mismanaged, leading to produced malnourishment, black markets, and hostility to state management of the food supply. The Germans seized about 20% of the French food production, which caused severe disruption to the household economy of the French people. French farm production fell in half because of lack of fuel, fertilizer and workers; even so the Germans seized half the meat, 20 percent of the produce, and 2 percent of the champagne. Supply problems quickly affected French stores which lacked most items. The government answered by rationing, but German officials set the policies and hunger prevailed, especially affecting youth in urban areas. The queues lengthened in front of shops. Some people—including German soldiers—benefited from the black market, where food was sold without tickets at very high prices. Farmers especially diverted meat to the black market, which meant that much less for the open market. Counterfeit food tickets were also in circulation. Direct buying from farmers in the countryside and barter against cigarettes became common. These activities were strictly forbidden, however, and thus carried out at the risk of confiscation and fines. Food shortages were most acute in the large cities. In the more remote country villages, however, clandestine slaughtering, vegetable gardens and the availability of milk products permitted better survival. The official ration provided starvation level diets of 1300 or fewer calories a day, supplemented by home gardens and, especially, black market purchases. The great hardships of wartime, and of the immediate post-war period, were succeeded by a period of steady economic development, in France, now often fondly recalled there as The Thirty Glorious Years (Les Trente Glorieuses). Alternating policies of "interventionist" and "free market" ideas enabled the French to build a society in which both industrial and technological advances could be made but also worker security and privileges established and protected. In the year 1946 France signed a treaty with US that waved off a large part of its debt. It was known as The Blum-Byrnes agreement (in French accord Blum-Byrnes) which was a French-American agreement, signed May 28, 1946 by the Secretary of State James F. Byrnes and representatives of the French government Léon Blum and Jean Monnet. This agreement erased part of the French debt to the United States after the Second World War (2 billion dollars). By the end of the 20th century, France once again was among the leading economic powers of the world, although by the year 2000 there already was some fraying around the edges: people in France and elsewhere were asking whether France alone, without becoming even more an integral part of a pan-European economy, would have sufficient market presence to maintain its position, and that worker security and those privileges, in an increasingly "Globalized" and "transnational" economic world. Reconstruction began at the end of the war, in 1945, and confidence in the future was brought back. With the baby boom (which had started as soon as 1942) the birthrate surged rapidly. It took several years to fix the damages caused by the war – battles and bombing had destroyed several cities, factories, bridges, railway infrastructures. 1,200,000 buildings were destroyed or damaged. In 1945, the provisional government of the French Republic, led by Charles de Gaulle and made up of communists, socialists and gaullists, nationalized key economic sectors (energy, air transport, savings banks, assurances) and big companies (e.g. Renault), with the creation of Social Security and of works councils. A welfare state was set up. Economic planning was initiated with the Commissariat général du Plan in 1946, led by Jean Monnet. The first « Plan de modernisation et d’équipement », for the 1947-1952 period, focused on basic economic activities (energy, steel, cement, transports, agriculture equipment); the second Plan (1954–1957) had broader aims: housing construction, urban development, scientific research, manufacturing industries. The debts left over from the First World War, whose payment had been suspended since 1931, was renegotiated in the Blum-Byrnes agreement of 1946. The U.S. forgave all $2.8 billion in debt, and gave France a new loan of $650 million. In return French negotiator Jean Monnet set out the French five-year plan for recovery and development. American films were now allowed in French cinemas three weeks per month. To aid the rebuilding of the French economy, the value of stolen resources were recovered from defeated Germany under the Monnet Plan. As part of this policy, German factories were disassembled and moved to France, and the coal-rich industrial Saar Protectorate was occupied by France, as had been done post-World War I, in the Territory of the Saar Basin. Thus in the 1947–1956 period, France benefited from the resources and production of the Saar, and continued to extract coal from the Warndt coal deposit until 1981. The Saarland reunited with Germany in 1957, and resolution of its situation led to the formation of the European Coal and Steel Community, precursor to the European Union, which played a significant role in Europe and France's economy in the later post-war period. Between 1947 and 1973, France went through a booming period (5% per year in average) dubbed by Jean Fourastié Trente Glorieuses, title of a book published in 1979. The economic growth is mainly due to productivity gains and to an increase in the number of working hours. Indeed, the working population was growing very slowly, the baby boom being offset by the extension of the time dedicated to studies. Productivity gains came from the catching up with the United States. In 1950, the average income in France was 55% of an American and reached 80% in 1973. Among the major nations, only Japan and Spain had faster growth in this era than France. Insisting that the period was not that of an economic miracle, but a mere catching up following an economic lag, French historian Jacques Marseille noted that if the economy had constantly grown at the same rate as that of the « Belle Époque », the wealth would have been the same at the beginning of the 1970s as that actually reached after the Trente glorieuses. The United States helped revive the French economy with the Marshall Plan whereby it gave France $2.3 billion with no repayment. France agreed to reduce trade barriers and modernize its management system. The total of all American grants and credits to France, 1946–53, came to $4.9 billion. By the late 1960s, France's economic growth, while strong, was beginning to lose steam. A global currency crisis meant a devaluation of the Franc against the West German Mark and the U.S. Dollar in 1968, which was one of the leading factors for the social upheaval of that year. The trente glorieuses era is usually considered to end with the 1973 oil crisis, which increased costs in energy and thus on production. Economic instability marked the Giscard d'Estaing government and the early years of the presidency of Francois Mitterrand, including a recession in the early 1980s, which led to the abandonment of dirigisme in favour of a more pragmatic approach to economic intervention. Growth resumed later in the decade, only to be slowed down by the economic depression of the early 1990s, which affected the Socialist Party. Liberalisation under Jacques Chirac in the late 1990s strengthened the economy. However, after 2005 the world economy stagnated and the 2008 global crisis and its effects in both the Eurozone and France itself dogged the conservative government of Nicolas Sarkozy, who lost reelection in 2012 against Socialist Francois Hollande. In spite of this, France's recent economic history has been less turbulent than in many other countries. Facts show that the average income in France, after having been steady for a long time, increased elevenfold between 1700 and 1975, which constitutes a 0.9% growth rate per year, a rate which has been outdone almost every year since 1975: By the early Eighties, for instance, wages in France were on or slightly above the EEC average. Jacques Marseille noted that the growth of in the standard of living has been as significant between 1973 and 2003 as in the period of the Trente glorieuses, in absolute numbers, but below that period in relative numbers, given higher inflation numbers. ↑ Kendall, Paul Murray. Louis XI: The Universal Spider (New York : Norton, 1971) ISBN 0-393-05380-6, p. 12. ↑ DeJean, Joan. The Essence of Style: How the French Invented Fashion, Fine Food, Chic Cafés, Style, Sophistication, and Glamour (New York: Free Press, 2005) ISBN 0-7432-6413-4, ISBN 0-473-26413-7, p. 15. ↑ Viala, Alain, Naissance de l'écrivain (Paris: Eds. de Minuit, 1985) ISBN 2-7073-1025-5, p.113, Collection: Le sens commun. ↑ Jouanna, Arlette and Jacqueline Boucher, Dominique Biloghi, Guy Thiec. Histoire et dictionnaire des Guerres de religion. (Paris: Laffont, 1998) ISBN 2-221-07425-4, pp. 421-422, Collection: Bouquins. ↑ Elise S. Brezis and François Crouzet, "The role of assignats during the French Revolution: An evil or a rescuer?" Journal of European economic history (1995) 24#1 pp 7-40, online. ↑ Michael Broers; et al. (2012). The Napoleonic Empire and the New European Political Culture. Palgrave Macmillan. pp. 209–12. ↑ Ralf Roth; Günter Dinhobl (2008). Across the Borders: Financing the World's Railways in the Nineteenth and Twentieth Centuries. Ashgate. p. 19. ↑ Angelo Riva, and Eugene N. White, "Danger on the exchange: How counterparty risk was managed on the Paris exchange in the nineteenth century," Explorations in Economic History (2011) 48#4 pp 478-493. ↑ Joseph A. Amato, "Eugen Weber's France" Journal of Social History, Volume 25, 1992 pp 879–882. ↑ Jan Whitaker (2011). The World of Department Stores. New York: Vendome Press. p. 22. ↑ Heidrun Homburg, "Warenhausunternehmen und ihre Gründer in Frankreich und Deutschland Oder: Eine Diskrete Elite und Mancherlei Mythen," ['Department store firms and their founders in France and Germany, or: a discreet elite and various myths']. Jahrbuch fuer Wirtschaftsgeschichte (1992), Issue 1, pp 183-219. ↑ Frans C. Amelinckx, "The Creation of Consumer Society in Zola's Ladies' Paradise," Proceedings of the Western Society for French History (1995), Vol. 22, pp 17-21. ↑ Brian Wemp, "Social Space, Technology, and Consumer Culture at the Grands Magasins Dufayel," Historical Reflections (2011) 37#1 pp 1-17. ↑ Martin Thomas, "French Economic Affairs and Rearmament: The First Crucial Months, June–September 1936." Journal of Contemporary History 27#4 (1992) pp: 659-670 in JSTOR. ↑ Kenneth Mouré (2002). Managing the Franc Poincaré: Economic Understanding and Political Constraint in French Monetary Policy, 1928-1936. Cambridge UP. pp. 270–72. ↑ Julian Jackson, Popular Front in France: Defending Democracy 1934–1938 (1988), pp 172, 215, 278-87, quotation on page 287. ↑ Douglas Johnson, "Léon Blum and the Popular Front," History (1970) 55#184 pp 199-206. ↑ Irwin M. Wall (1991). The United States and the Making of Postwar France, 1945-1954. Cambridge U.P. p. 55. Bouchard, Constance Brittain. Holy entrepreneurs : Cistercians, knights, and economic exchange in twelfth-century Burgundy (Ithaca, N.Y. : Cornell University Press, 1991) ISBN 0-8014-2527-1. Farmer, Sharon A.. Surviving poverty in medieval Paris : gender, ideology, and the daily lives of the poor (Ithaca, N.Y. : Cornell University Press, 2002) ISBN 0-8014-3836-5. Pirenne, Henri. Economic and social history of medieval Europe (New York : Harcourt, Brace & World, ). Braudel, Fernand. Civilization and capitalism, 15th-18th century (Civilisation matérielle, économie et capitalisme) (Berkeley : University of California Press, 1992) ISBN 0-520-08114-5 (v. 1), ISBN 0-520-08115-3 (v. 2), ISBN 0-520-08116-1 (v. 3). Braudel, Fernand. The wheels of commerce (Jeux de l'Echange) translation from the French by Siân Reynolds (London : Fontana Press, 1985) ISBN 0-00-686078-8. Gwynne, Lewis. France, 1715-1804: power and the people (Pearson/Longman, 2005) ISBN 0-582-23925-7. Heller, Henry. Labour, science and technology in France, 1500-1620 (Cambridge University Press, 1996) ISBN 0-521-55031-9. Hoffman, Philip T. Growth in a traditional society : the French countryside, 1450-1815 (Princeton University Press, 1996) ISBN 0-691-02983-0. Le Roy Ladurie, Emmanuel. The peasants of Languedoc (Paysans de Languedoc) (University of Illinois Press, 1974) ISBN 0-252-00411-6. White, Eugene. "France and the Failure to Modernize Macroeconomic Institutions," in Transferring wealth and power from the Old to the New World: Monetary and fiscal institutions in the seventeenth through the nineteenth centuries (2001) pp 59–99. 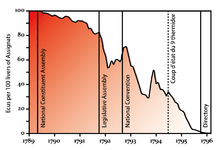 White, Eugene N. "Free Banking during the French Revolution," Explorations in Economic History (1990) 27#2 pp 251–76. Askenazy, Philippe. The Blind Decades: Employment and Growth in France, 1974-2014 (University of California Press; 2014) 252 pages; studies France's mediocre performance in recent decades, including the Eurozone crisis and Great Recession. Cameron, Rondo E. France and the economic development of Europe, 1800-1914 (2000). Cameron, R. C. Banking in the Early Stages of Industrialization (1967). Clapham, John H. The Economic Development of France and Germany: 1815-1914 (1936). Lebovics, Herman. Bringing the Empire back home: France in the global age (Duke University Press, 2004) ISBN 0-8223-3260-4. Johnson, H. Clark. Gold, France, and the Great Depression, 1919-1932 (Yale University Press, c1997) ISBN 0-300-06986-3. Mathias, Peter, and M. M. Postan, eds. Cambridge Economic History of Europe. Vol. 7: Industrial Economies. Capital, Labour and Enterprise. Part 1 Britain, France, Germany and Scandinavia (1978) pp 231–81. Smith, Michael Stephen (2006). The Emergence of Modern Business Enterprise in France, 1800-1930. Harvard University Press.